Deep in the Pacific Northwest, in the heart of Seattle (47.5953° N, 122.3317° W), there is a site that remains the subject of intense scrutiny and frequent scientific inquiry. Though it has no official name, it has come to be known popularly as Area 29. 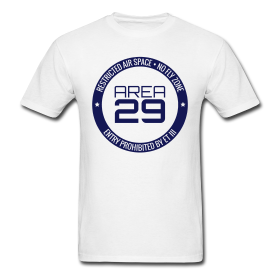 Located within CenturyLink Field, Area 29 is best described as a combination of the infamous top secret government military installation, Area 51, and the Bermuda Triangle, an area of the Atlantic Ocean where planes and ships have vanished without a trace, never to be found. What happens within Area 29 remains largely unknown; virtually no one has ever successfully traveled into it and returned. At times, based on the human carnage around its perimeter, it appears new forms of experimental weaponry are being tested there. There are also widely reported instances of objects that have flown into Area 29 — footballs, among them — and never been seen again. Sightings of paranormal or alien activity are abundant, focusing in particular on humanoid creatures that seem to move at otherworldly speeds. Earl Thomas, free safety for the Seattle Seahawks, is the only known inhabitant of Area 29. His presence there has generated rampant speculation about his origins, causing many to question whether he is, in fact, human. In his blog on EarlThomas.com — also named Area 29 — Earl provides an exclusive, ongoing, behind-the-scenes look into one of the world’s great unexplained mysteries.